I realize that this is the third Project 365 post that involves fruit. But the truth is that fruit is so good for you. For good health a minimum of 5 servings of fruit and vegetables a day is recommended. Fruit is high in fiber, water and vitamin-C as well as various phytochemicals which research is indicating aids in disease prevention. 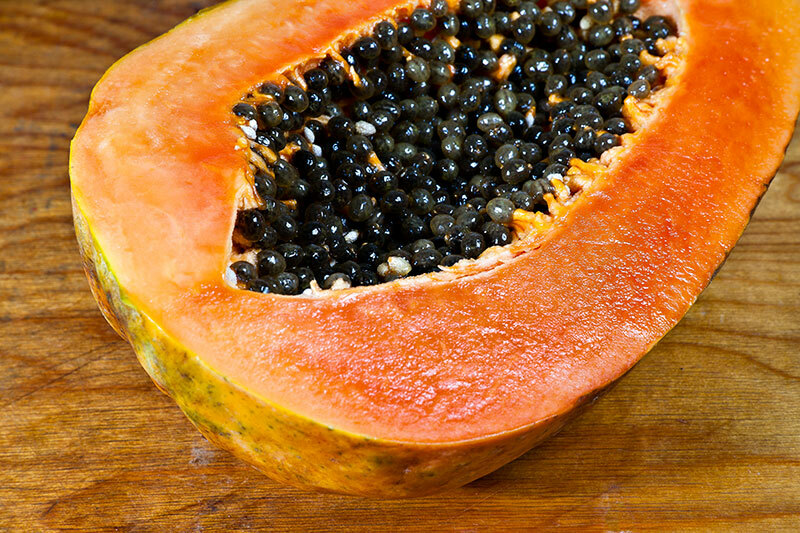 Papaya is thought to be native to central Mexico and Central America. They are cultivated in most tropical countries. The seeds are edible and have a sharp taste to them. The leaves of a papaya tree can be steamed and served like spinach. In some parts of the world the leaves are made into a tea to prevent and treat malaria (although scientific proof is lacking). Papaya contains papain which is a protease enzyme that can be used a meat tenderizer and is included in powdered meat tenderizers. At times I have taken papaya extract to aid with stomach discomfort and digestive issues. It’s probably fair to say that in the United States our fast paced, processed junk food, lifestyle means we are not eating nearly enough fruits and vegetables and that probably plays a large role in the amount of disease and sickness people here experience. We all probably need to be eating more fresh fruits and vegetables. I like to look at it this way. With the rising cost of health insurance one way to make sure we don’t go broke trying to afford it is to limit the number of times we have to visit the doctor. One way we can do that is to live a healthy lifestyle that includes eating healthy (fresh fruits and vegetables) and exercising on a daily basis. I believe that it is true that an apple (or papaya) a day keeps the doctor away. Eat healthy, live healthy.